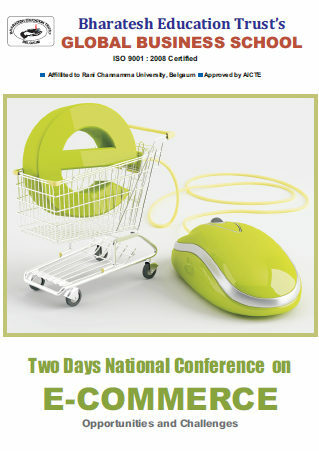 A National Level conference on E-commerce has been organized by Bharatesh Education Trust’s Global Business School, Belgaum on the 25th and 26th of April, 2014 at the Foundry Cluster Hall. The conference is in association with the E-commerce Association of India and is being attended by senior members from Flipkart, Capgemini, etc. as also CEOs and office bearers of various E-commerce companies from India, academicians, research scholars and students. Research papers shall be presented at the conference and selected papers will be published as proceedings book with ISBN number. The seminar aims to bring forth the opportunities in the emerging e-commerce segment as also discuss challenges faced by entrepreneurs in the e-commerce domain. Belgaum being a booming tier -2 city, with high internet penetration and considerably high levels of disposable income, is already witnessing a surge in online buying. The seminar will bolster the possibilities for the Belgaum entrepreneurs to tap the e-commerce market as well as provide a first- hand experience to professionals from the e-commerce domain to understand Belgaum market and reach out to a wider consumer base. Students, academicians, research scholars, professionals, owners of companies with interest or scope in e-commerce business can attend the conference. Here they can interact with the guests and resource persons who will spend considerable time with the delegates.